Very few diagnoses shock patients as much as being told that they have cancer, a modern pandemic around the world. Cancer is a multifactorial disease that requires a multifactorial treatment plan: medical, nutritional, and lifestyle changes as well as emotional, social, and spiritual support. An effective approach for cancer must be truly integrated. 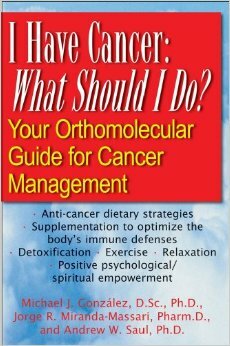 This book shows that optimum nutrition and dietary supplementation should be part of every cancer treatment. Nutrition is not only preventive–it also has powerful therapeutic potential. Orthomolecular medicine restores the optimum environment in the body for fighting cancer by correcting imbalances or deficiencies. This is not your average book about cancer. The authors, in addition to being healthcare practitioners, have had personal experiences with this potentially devastating disease. “I Have Cancer: What Should I Do? maps out a program the authors themselves would follow that includes: anti-cancer dietary strategies, supplements to optimize the body’s immune defenses, detoxification therapy, exercises, relaxation techniques, and positive psychological/spiritual empowerment. Cancer patients benefit from the combination of conventional and orthomolecular therapy. Nutritional strategies can improve one’s overall strength to maintain one’s health and win the battle against cancer.